I have discussed stretching in a number of blogs and in-particular the benefits of dynamic stretching. To most runners dynamic stretching consists of swinging your legs forward and back and side to side and kicking your bum with your heels. Whilst there is nothing wrong with this there are far more effective ways to go about it. This blog will go over the principles of dynamic stretching and show you how to dynamically stretch your hip flexors. Static stretching may lengthen a muscle but it doesn’t give the muscle the strength to control the muscle in the lengthened position. A simple analogy is if you give a car a bigger engine but don’t increase the cars braking ability then the smart driver is not going to drive it any faster as the risk of losing control is too high. If you give a muscle an increased range of movement without the strength to control it then the brain isn’t going to use that range as the risk of injuring the muscle is too high. Dynamic stretching increases both the range and the strength to control that range which means the extra range is instantly transferable to an exercise like running. Our bodies move in three dimensional space. The body achieves this three dimensional movement by combining movement in three different planes; the sagittal plane (moving forwards or backwards) , the frontal plane (moving sideways) and transverse plane (rotational movement). Whilst you may think of running as being only in one plane- ie we run forwards, the reality is that although the overall direction of travel is forwards every joint in our body goes through movement in all three planes. 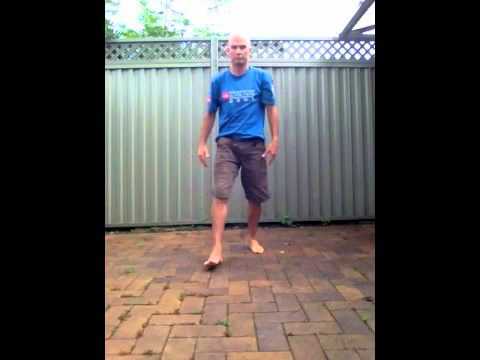 For example when the right foot lands our pelvis tilts forward causing the lower back to extend, the hip also drops slightly on the unsupported left side causing the lumbar spine to tilt to the right and as our left leg swings through it rotates the pelvis causing rotation in the lumbar spine. So our lower back undergoes extension in the sagittal plane, side bending (lateral flexion) in the frontal plane and rotation in the transverse plane. This 3 dimensional movement occurs at every joint of the body. Traditional stretching often ignores this three dimensionality of human movement. The benefits of stretching are position dependant. Like any exercise the benefits you gain from it are specific to the speed, joint angle , body position and load of the exercise. So if you lay on your back to stretch your hamstrings in a slow controlled manner then your hamstrings will have more flexibility when you lay on your back and stretch them in a slow and controlled manner. There won’t be any benefit when you go for a run however. We need to perform our stretches in positions that more closely resemble how that muscle is stretched when we run. Effective 3 Dimensional Dynamic Stretching involves dynamic end range movement in all three planes. Keeping the movement dynamic rather than holding the end stretched position teaches the body how to go into the stretch and also how to get back out of it again. Movements don’t have to be fast or ballistic to begin with but as the movement becomes more fluid the speed should increase to replicate the demands of the sport you are training for. Have a look at the video to see how we can stretch our hip flexors in a 3 dimensional dynamic manner. There are ways to make this more and more dynamic which I will go through in a future blog. One of the best things about this type of stretching is you dont need to warm up, in fact the stretch becomes the warm up. Start with slow movements , feeling your way into the stretch and as the movement starts to losen up increase both the stretch and the speed of the movement.